What are the Early Signs of Tooth Decay? When we look at the fledgling stages of enamel damage, we must keep in mind that the only way to identify its presence is to be examined by either your hygienist or dentist. That’s because the decay won’t be visible from your vantage point. Furthermore, your local professionals are trained to look for certain details. Increased Sensitivity to Extreme Temperatures – By the time you start to notice any type of pain sensation, it means that the decay has gone beyond your enamel and entered the dentin – the first layer of the tooth where there are nerves. 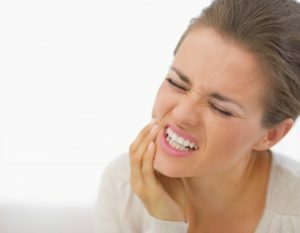 Occasional Pain When Biting Down – Another sign of tooth decay is occasional pain from the pressure applied when you bite down and chew your food. Dark Spots – Over time, bacteria and plaque accumulation can cause dark spots to appear on your teeth. At this stage, your dentist can more than likely restore your tooth with a cavity filling. However, if the decay is allowed to travel past the dentin area and into the pulp, causing an infection, you’ll need a more involved procedure. Decay that has gone beyond the dentin and has entered the sacred space called the inner area, will require a root canal to restore the tooth. That’s because this part of the structure houses the majority of the tooth’s nerves and canals. X-Rays – Before any work is done, your dentist will have a round of X-Ray photos of your oral cavity to identify exactly where the decay is. Initial Incision – After administering a local anesthesia, the professional will then make the initial incision to gain access to the inner tooth. Pulpectomy – Next, the decayed tissue will be removed, and the area cleaned thoroughly. Seal – Finally, the vacated space will be filled with a compound called gutta-percha, and the tooth will be sealed. After a couple of days of healing, your dentist will give you the green light to gradually get back into living life as normal, with a fully restored tooth. If you’re experiencing some of the signs mentioned above, then don’t hesitate to contact your dentist in Yakima to get the help you need. A graduate of the University of Washington Dental School, Dr. Lyle I. Bonny has been practicing dentistry for three decades. Throughout his career, he has placed the quality of the patient experience at the top of his list of priorities. To have your decayed tooth restored efficiently and comfortably, you can visit Dr. Bonny at Terrace Heights Dental Center, and he can be reached for more information through his website.